1 med. to sm. onions, chopped sm. 1/2 med. green pepper, chopped sm. 1 rib celery, chopped sm. ½ cup mushrooms, chopped sm. 1 or 2 green onions, chopped sm. Wash and dry shrimp; salt lightly (I’m using a little of Andrea’s homemade seafood rub). Melt butter in pan; add garlic and parsley, pepper and lemon seasonings. When butter is slightly brown, add onions, green pepper, mushrooms, celery and green onion. Stir and cook about 3 minutes. Add shrimp, stir and cook about 5-6 minutes. 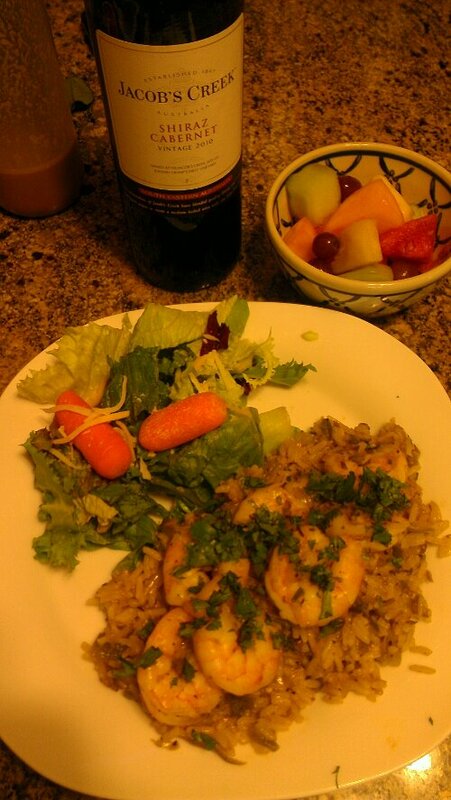 Remove shrimp to warm plate and keep warm. Leave as much of the onions, etc., as possible. Add brandy or cognac; bring to a boil until liquid is reduced by half. Add cooked rice to pan and mix well with vegetables in pan until very warm. Place in a bowl or dish, top with the shrimp and garnish with some fresh chopped cilantro. NOTE: Some of shrimp may be cut or left in pan to mix and stir fry with rice and seasoning or all shrimp may be left whole or cut up and left in pan to stir with rice. Tonight I’m serving mixed greens field salad and fruit compote. Clean leeks under running water and cut into 1/2″ squares only use the white part. Peel and dice potatoes (I am leaving the skins on). Cut bacon into small squares and fry. Add butter and let it melt, and then add vegetables. Sauté about 5 minutes without browning. Stir in stock, season to taste. Cover and simmer 30 minutes until vegetables are tender. Add milk and flour a little at a time, NOT boiling, and then stir in cilantro. 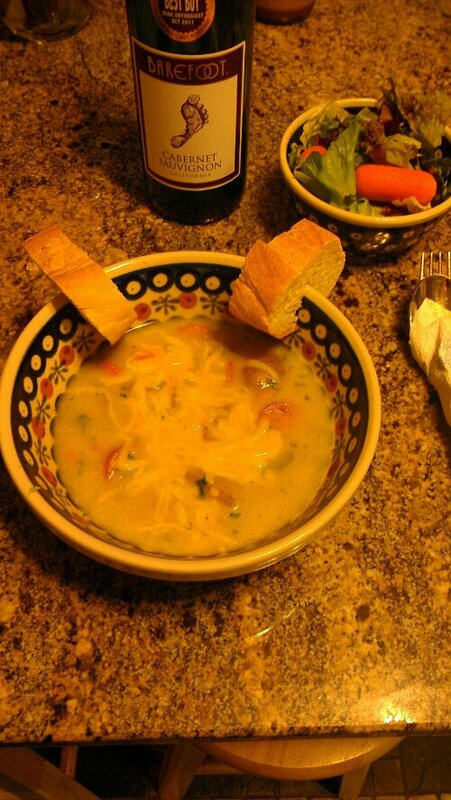 Serve in soup bowls with liberal sprinkling of grated cheese. Serves 4. Tonight I’m serving with fresh garden salad and crusty artisan bread or scones. Pair with your favorite wine! Black Tie event at the Knights of Columbus tonight… simple Bacon and eggs before event then dinner. Heat oil in a skillet and sauté onions for 5 minutes, then stir in turkey and garlic with oregano and cook turkey through. In a blender, put tomatillos, cilantro, and chilies, and blend smooth. Stir into turkey mixture and add salt to taste. Add this mixture to cooked beans and adjust salt. You can get this from a bowl or over a bed of pasta. 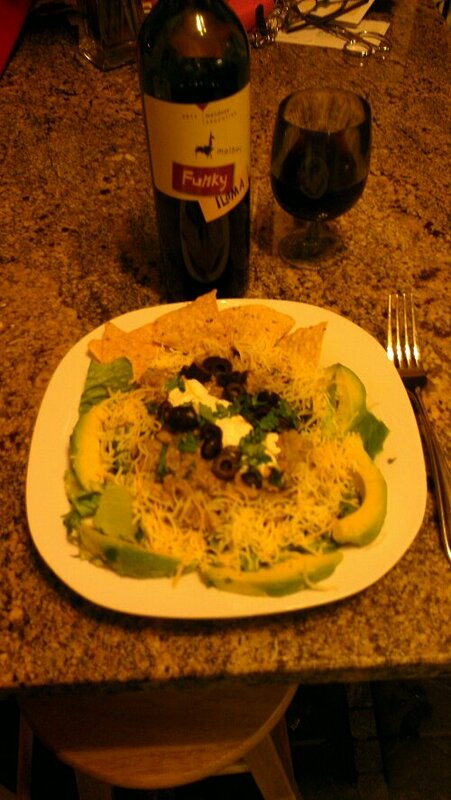 Tonight I’m serving with Doritos over a bed of lettuce and topping it with low-fat sour cream and Monterrey Jack cheese. Might even slice up an avocado and use as a garnish. In a small saucepan, warm over low heat the sherry, honey, ginger, lemon zest, cilantro, dill and basil. Add mustard seed to warm sauce just before serving. Grill whole pork tenderloin until it is almost cooked, basting with a small amount of sherry sauce if necessary. Remove from grill and slice into 1″ medallions. Finish grilling the meat until fully cooked (but still moist). Serve meat with the warm sherry sauce. 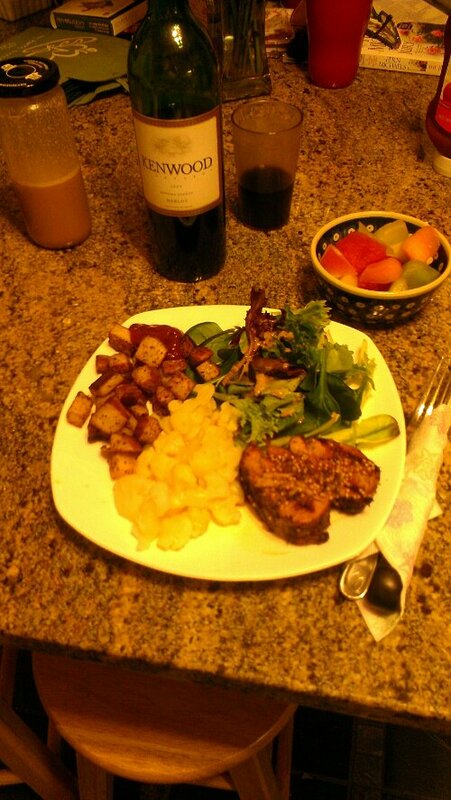 Tonight I’m serving with oven broiled new potatoes, cauliflower, and field greens salad and fruit compote.